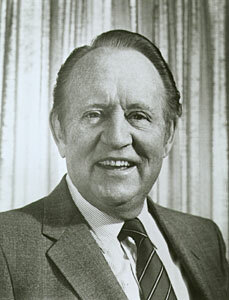 Art Linkletter was abandoned as an infant, adopted and raised by a preacher. He first showed his entrepreneurial spirit by sorting through discarded lemons at a local fruit-packing plant, picking the least-obviously rotten fruit, and selling the produce door-to-door. He hosted House Party and People Are Funny both on radio and later on television, and is best remembered for his interviews with children, Kids Say the Darndest Things. Linkletter's daughter Diane committed suicide in 1969, allegedly under the influence of LSD (the story that her father maintained). An autopsy revealed no drugs in Diane's system, but that didn't stop the "killed by LSD" story, and Linkletter quickly became one of America's most prominent spokesmen for the War on Drugs. He was appointed to President Nixon's National Advisory Council for Drug Abuse Prevention. In his 90s, Linkletter served as National Chairman of USA Next, a group that promotes itself as "the conservative alternative to the liberal AARP (American Association of Retired Persons)." The organization accepted millions of dollars from large pharmaceutical companies, and hired most of the creative crew behind the "Swift Boat Veterans for Truth." USA Next purchased ads touting George W. Bush's early 2000s changes to the Medicare program.